SF1546 is a high performance, low cost, highly integrated current mode PWM controller for offline flyback converter applications. In SF1546，PWM switching frequency with shuffling is externally programmable, which can ease system design greatly .when the output power demands decrease ,the IC autocratically decreases switching frequency for high power conversion efficiency .When the current set-point falls below a given value, e.g. the output power demand diminishes, the IC enters into burst mode and provides excellent efficiency without audio noise. The IC can achieve "Zero OCP/OPP Recovery Gap" using SiFirst′s proprietary control algorithm. Meanwhile, the OCP/OPP radiation versus universal line input is compensated. The IC has built-in synchronized slope compensation to prevent sub-harmonic oscillation at high PWM duty output. The IC also has built-in soft start function to soften the stress on the MOSFET during power on period. 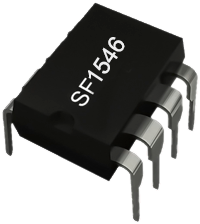 SF1546 integrates functions and protections of Under Voltage Lockout (UVLO), VCC Over Voltage Protection (OVP), Cycle-by-cycle Current Limiting (OCP), All Pins Floating Protection, Over Load Protection (OLP), RT Pin Short-to-GND Protection, Gate Clamping, VCC Clamping, Leading Edge Blanking (LEB). SF1546 is available in DIP8 packages.